Sir Paul was born in Coventry and joined the Warwickshire and Coventry Constabulary in 1969. He subsequently served in a variety of roles in West Midlands Police before moving to Northamptonshire as a Superintendent in 1988. He was appointed Assistant Chief Constable of Kent Constabulary in 1992 before being promoted to Deputy Chief Constable of Suffolk Police in 1994. 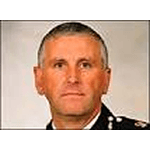 He became Chief Constable of Suffolk in 1998 and moved back to the West Midlands Police as Chief Constable in 2002. Sir Paul led the West Midlands Police for seven years before retiring in 2009. Sir Paul was awarded the Queens Police Medal in 1997 and received his Knighthood in the Queen’s Birthday Honours List 2007. He sat as the Police Advisor supporting Lord Justice Leveson in the Inquiry into the culture, practice and ethics of the press. He is a Trustee of the UK Police Memorial Charity and supports a number of Birmingham charitable organisations.